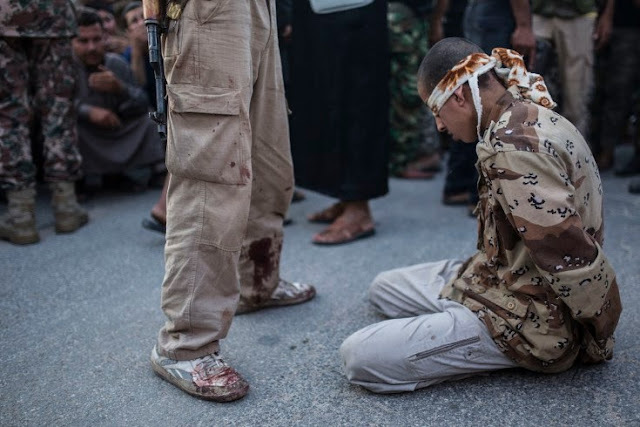 A young Syrian man is executed by ant-regime rebels in the town of Keferghan, near Aleppo, on August 31, 2013. 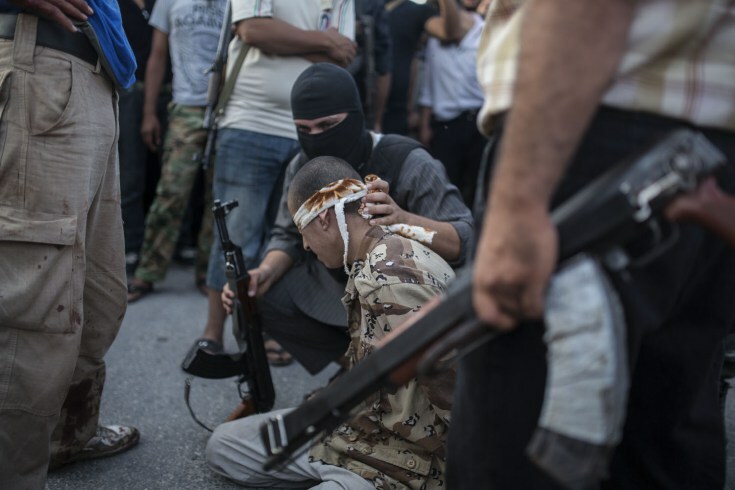 An anti-regime rebel whispers into the ear of the man before his execution. The man struggles as his executioners attempt to restrain him. 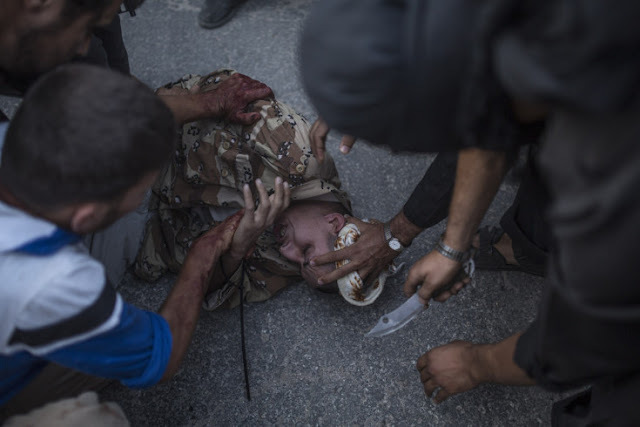 Anit-regime rebels gather around the man to restrain him just before his execution. All wars are vicious, but the civil war in Syria seems every day to set new standards for brutality. As the fighting rages in its third year, increasing numbers of atrocities are committed by soldiers and fighters from forces loyal to the regime of President Bashar Assad, as well as armed rebels and Islamic militants from the numerous, loosely aligned groups opposing Assad. 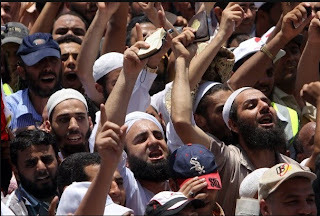 The violence is frequently sectarian in nature, with fighters claiming they act in defense of their faith, be it Sunni, Alawite, Shiite or any of the other sects that contribute to Syria’s religious landscape. 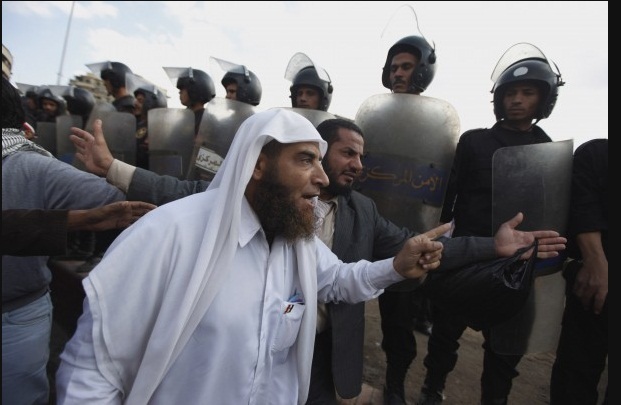 Since the uprising that ousted Hosni Mubarak, Islamists and liberals have quarreled over the country’s religious tenor. Mohammad Tolba, 32, seen here leading a prayer, founded Salafyo Costa shortly after the revolution. The movement, named after a popular, upscale coffeehouse chain, seeks to improve the image of Salafists, conservative Muslims who were demonized by the former regime. For months, Egypt's Muslim Brotherhood has driven with fierce determination and the fundamentalist group is expected to dominate in the parliamentary elections. But the Brotherhood stayed on the sidelines of last week's furious protests, hurting its image among many Egyptians, and the chaos will undermine the legitimacy of the vote no matter who the winner. 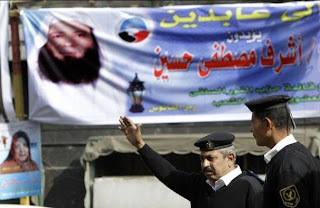 An Egyptian policeman gestures under a banner supporting Ashraf Mustafa Hussien, an ultraconservative Salafi candidate for the Parliamentary elections, in Cairo, Egypt. Tens of thousands of Egyptians packed Tahrir Square, with Islamist groups dominating a demonstration that had been intended to show unity during a fragile transition from ousted president Hosni Mubarak's regime. 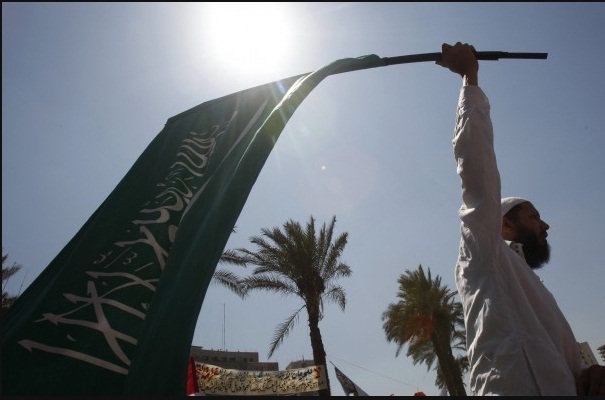 An Egyptian protester waves a Saudi Arabian flag at Tahrir Square. Thousands gathered to show that Islamists and secularists were united in wanting change, though divisions remain on how hard to press the military rulers about the pace and depth of reforms. 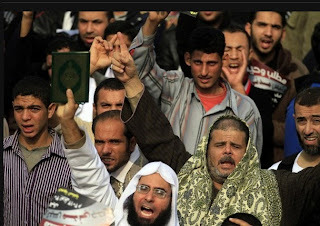 Muslim chants such as "There is no God but God" and "Islamiya, Islamiya" dominated. 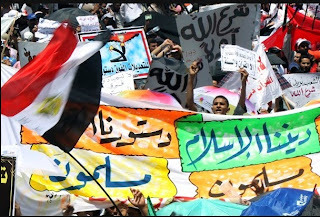 Some waved banners saying "Islamic Egypt." A protester from a Salafist group shouts Koranic verses as he holds an Egyptian flag with the words, "There is no God but God and Mohammad is his prophet" in Tahrir Square. 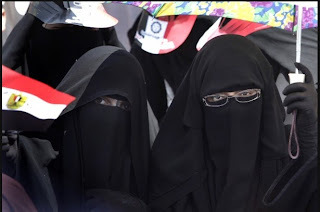 Egyptian veiled women wave an Egyptian flag under their sun shade at Tahrir Square, the focal point of the Egyptian uprising, in Cairo. 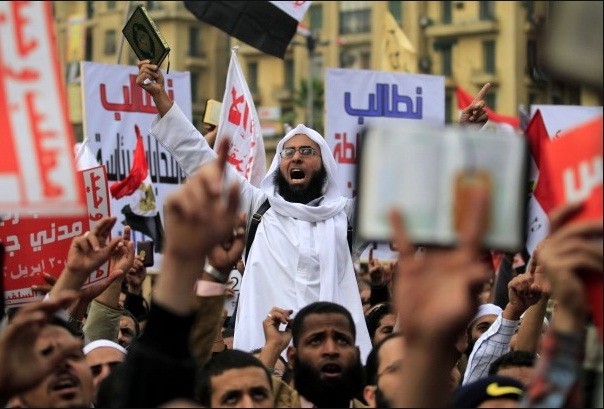 Thousands rallied seeking to unify their demands despite rifts over key issues between liberal activists and Islamist groups. 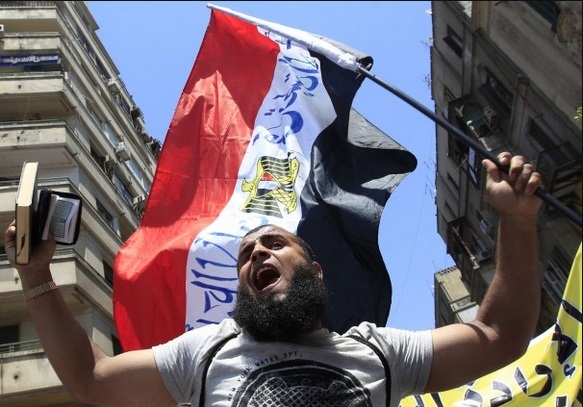 Egyptian demonstrators rally in downtown Cairo's Tahrir square.